On July 25th and 26th the BBC put out a number of reports concerning the rioting in Jerusalem and Palestinian Authority controlled areas of Judea & Samaria. Assad failed to inform viewers that Marwan Barghouti is a convicted Fatah terrorist and one of the leaders of both the first and second Intifadas. He was in fact sentenced to five terms of life imprisonment after having been found guilty of involvement in terror attacks in which five people were murdered and an additional 40 years imprisonment for attempted murder. Barghouti has on numerous occasions called for a third Intifada but Assad fails to mention that significant point. Neither does she – nor any other of the BBC journalists reporting on this topic – make any mention of the calls from the Hamas leadership for violence. “Hamas officials in the Gaza Strip and abroad are calling on Palestinians in the West Bank to start a Third Intifada. Qatar-based Hamas spokesman Husham Badran, responding to the reports of clashes between thousands of Palestinians and police at the Qalandiya checkpoint, says the timing is right to rise up, Israel Radio reports. “This is your opportunity,” he says to West Bank Palestinians. Hamas official Izat a-Rishk calls, on Twitter, for a revolution against the enemy, adding that the blood of Gazans ignites the West Bank. 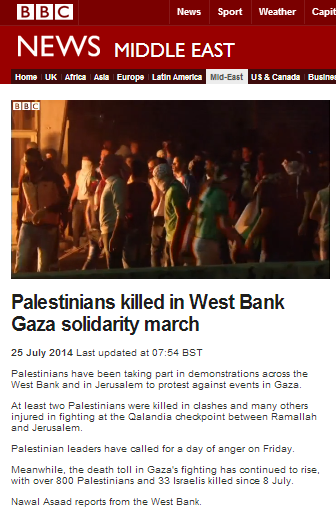 Also on July 25th, the BBC News website published a written report under the same title of “Palestinians killed in West Bank Gaza solidarity march“. That article includes an equally tepid description of Marwan Barghouti from Nawal Assad. “At least two Palestinians have been killed and 200 wounded in the West Bank during protests against Israel’s campaign in Gaza, officials say. Palestinian leaders in the West Bank have called for a “day of anger” on Friday, one of the last days of Ramadan. The Israeli police did indeed report the use of live fire by rioters but in fact, not just “Israel said” that its security personnel had been shot at: Fatah’s Al Aqsa Martyrs Brigade has clearly stated on more than one occasion that its members used live fire at the riot in Qalandiya. That fact has not been reported by the BBC at all. “Large protests were also reported in Jerusalem on Thursday evening, after Israeli police prevented men under 50 from visiting the al-Aqsa mosque. The report fails to adequately clarify that the age restriction on males entering the most sensitive site in Jerusalem was part of measures to prevent violence. Concurrently, calls for a “Day of Rage” (not a “Day of Anger” as written in some BBC reports) on Friday July 25th also came from assorted Palestinian sources. That same theme of supposed Israeli interference with freedom of worship – whilst failing to adequately clarify the context of incitement to violence from Palestinian leaders of various factions – also appeared in a July 26th filmed report by Orla Guerin; ‘parachuted in’ from Cairo. 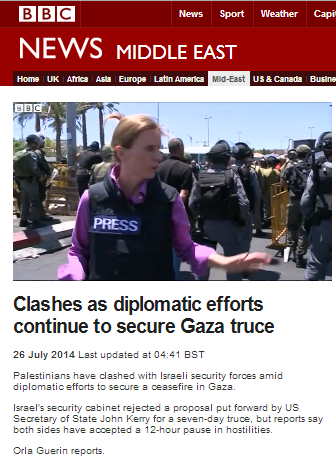 Guerin’s report also appeared on the BBC News website’s Middle East page under the title “Clashes as diplomatic efforts continue to secure Gaza truce“. “In Jerusalem’s Old City, open-air prayers under the watchful eye of Israeli troops. Young Palestinian men were blocked from reaching the city’s most important mosque which is often a flash point. Israel’s struggling to contain the fury over the killings in Gaza. Whilst it is entirely predictable that the BBC would frame these riots as a reaction to the Hamas-initiated hostilities in the Gaza Strip, the fact is of course that calls for a third Intifada and incitement to violence have been going on for quite some time now. 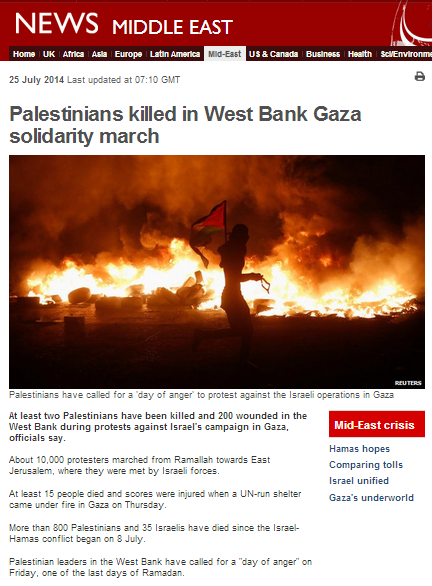 As we have noted here previously on numerous occasions, the BBC has consistently failed to report incitement coming from Fatah’s Al Aqsa Martyrs Brigades and has likewise been silent on the topic of that organisation’s missile fire from the Gaza Strip during the recent hostilities and on Fatah incitement during the searches for the three kidnapped and murdered Israeli teenagers last month. The whitewashing of convicted Fatah terrorist Marwan Barghouti and the failure to inform BBC audiences that a Fatah terrorist organization used live fire against Israeli security personnel is therefore entirely consistent with the BBC’s track record.